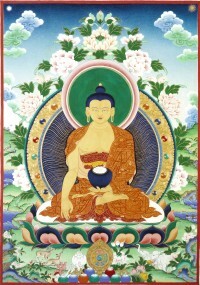 Buddha Shakyamuni. Image by Jane Seidlitz. On March 11, 2011, a massive earthquake hit Japan, triggering a devastating tsunami killing 14,704 (with 10,969 still missing) and severely damaging several nuclear reactors on Japan’s coastline. Shortly after, Lama Zopa Rinpoche translated and dictated a collection of practices to control earthquakes and the four elements, commenting that these practices are also beneficial as protection against radiation. Rinpoche advised that these short practices be done from time to time.